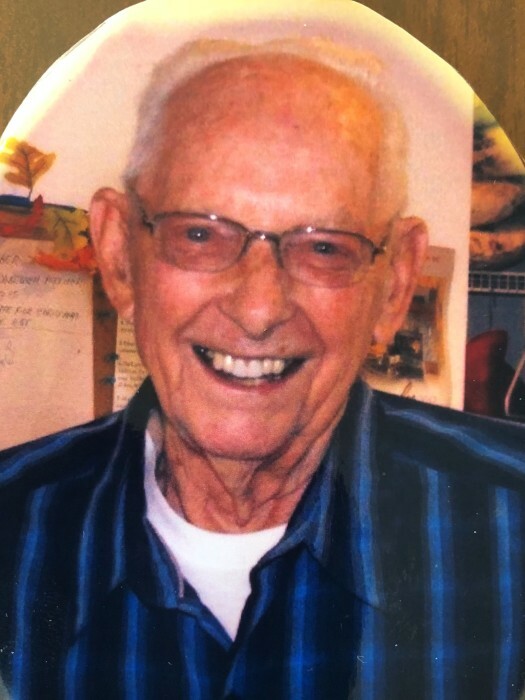 Donald E. Weiss Sr., 98 of Manville passed away Sunday morning (September 9th) at Heritage Health, Streator. A visitation will be held Tuesday from 4 – 7 PM and Wednesday from 10 – 11 AM at the Winterrowd Funeral Home. Services will be held Wednesday at 11 AM at the funeral home. Burial will be in the St. Anthony’s Cemetery. Serving as pallbearers will be grandsons, Brian, Ken, Mark, Tyler and Jared Weiss, Josh, Justin and Ryan Folkers. Don was born on March 12, 1920 in Streator to John and Emma (Ranger) Weiss. He married Charlotte Conrad on November 2, 1940. She preceded him in death on November 12, 2004. Surviving are sons Robert (Carol) Weiss of Manville, John (Kim) Weiss of Oskaloosa, Iowa and Jim (RayAnn) Weiss of Pontiac, daughter Nancy (Wayne) Folkers of Dwight, daughter-in-law Sharon Weiss of Clearwater, FL, 17 grandchildren, 35 great-grandchildren and several great-great-grandchildren. He is preceded in death by his parents, his wife Charlotte and a son Donald Weiss Jr.
Don graduated from Streator High School in 1938. He retired from Anthony Truck Body in 1975 and Streator Unlimited in 1999. Don was one of the founders of the Streator Little League Programs. He was an avid bowler, having retired 2 seasons ago. Memorials may be made to either the Streator Unlimited or to a charity of the donors choice.